Born of myth, legend, and even modern film and literature, monsters such as the mummy, vampire, werewolf, and zombie are the stuff of nightmares - and frequent foes of heroic adventurers! Along with flesh golems, gargoyles, ghosts, ghouls, hags and the mysterious derro, these ten monsters are staples of horror fiction and the bane of countless would-be heroes. This book explores the origin of these creatures (in both the game world and real-world history), as well as their creation, habitat, society, motivations, and role in a campaign. Each creature also includes information on new and deadly creature variants, such as nosferatu vampires, corpse chill mummies, gemstone gargoyles, host corpse zombies, and phantasmagoric ghosts. What's more, each chapter provides several new and notable examples of each creature, as well as a fully statted and ready-to-run sample monster, whether it's a flesh golem barbarian, a derro magister, a ghoul necormancer, a hag water-witch, or a lycanthrope-hunting werewolf. 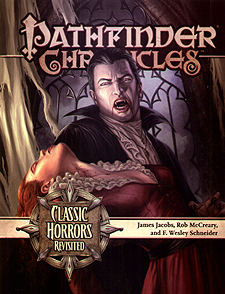 Whether your campaign is a standard fantasy monster hunt, a gothic romance, or an exercise in terror, Classic Horrors Revisited provides both historical insight and fresh new spins on these traditional icons of fear!